Here is a King Street that none of us have ever known. It is only a small section of the street, but it is tightly packed with businesses. 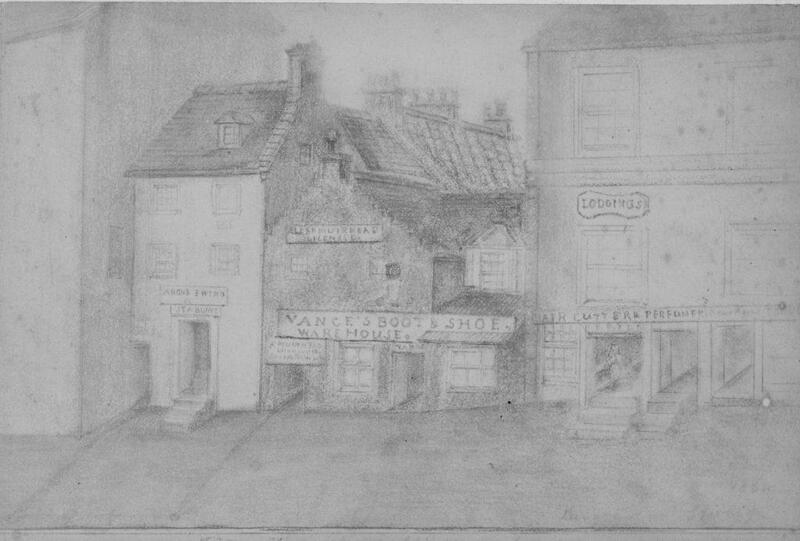 On the left is Angus Ewing, Stabling, then Vance’s Boot and Shoe Warehouse, where a street level entry gives access to Alexander Muirhead’s licenced premises above. Next door is a Hair Cutter and Perfumer, with Lodgings in the tenement above. The buildings are mixed in style. The 18th century building of the shoe warehouse has its gable end to the street, with crow steps to access the roof. The roof beyond is pantiled and the buildings appear to have grown without much input from either architects or planners, and are far different from the relatively handsome symmetry of King Street today. The image is not clear as it is a photograph of an original drawing by Mr Rinzinski, a Polish national who taught languages at the Old High School of Stirling. He delighted in drawing vernacular building in the town. Some of the images were photographed by Mr Rodgers (known as the promoter of the Wallace Monument) while in Baillie Christie’s possession, The sketches were returned to the artist and may survive somewhere.